The KegSpeed tracker is an active radio module powered by a battery that lasts five years. The signal produced by a KegSpeed tracker is detected by normal, everyday mobile devices. The mobile device uses its GPS and bluetooth radios to detect and communicate with KegSpeed trackers. Whenever a mobile device with a KegSpeed application is within range of a keg with a KegSpeed tracker, the GPS coordinates of the mobile device is used to locate the keg. 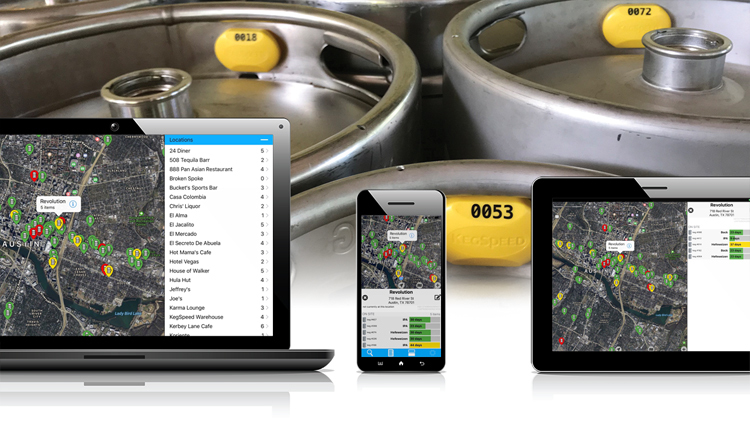 A mobile device can detect kegs nearby up to a range of approximately 80’. Any kegs within range of the mobile device are located, irrespective of their owner. Each mobile device automatically and in the background tracks all kegs that come within range of it. The security and reporting functions of KegSpeed insure that in the foreground, the owner of the mobile device only sees kegs they have permission to see. Any person can install a KegSpeed app and track kegs – a sales person; delivery driver; distributor; line cleaner; etc. As kegs move throughout the marketplace, and come in contact with mobile devices having a KegSpeed compatible app installed, each keg is located and tracked. The KegSpeed application not only detects the presence of nearby trackers, but also measures the distance to each tracker. Using this distance, KegSpeed is able to continuously improve its location measurement. 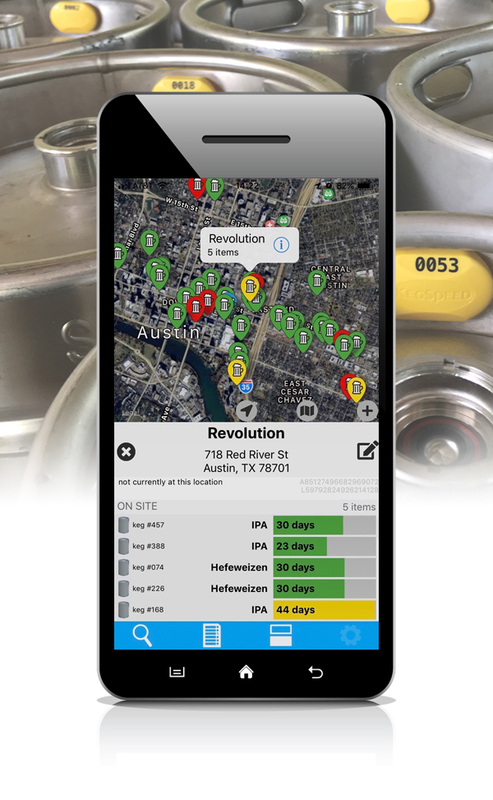 As a mobile device moves in relationship to a tracker, getting nearer to or farther from it, KegSpeed automatically improves the determination of the kegs position. This is how KegSpeed is able to distinguish between on-premise retail locations that are within close range of each other. Also, it is not necessary for the mobile device to have an active internet connection at the time of detection, making it possible to locate kegs inside metal cold rooms. The KegSpeed application runs automatically and in the background on a mobile device – it is not necessary for a user to interact directly with the application. Once installed, the software in the app continues to operate in the background as necessary to communicate with the KegSpeed system, without requiring any user input. 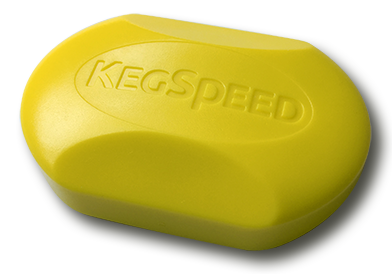 Each KegSpeed tracker has a battery that lasts five years without requiring any maintenance. Because the KegSpeed tracker is an active radio module, it works well from inside stacks of metal kegs. 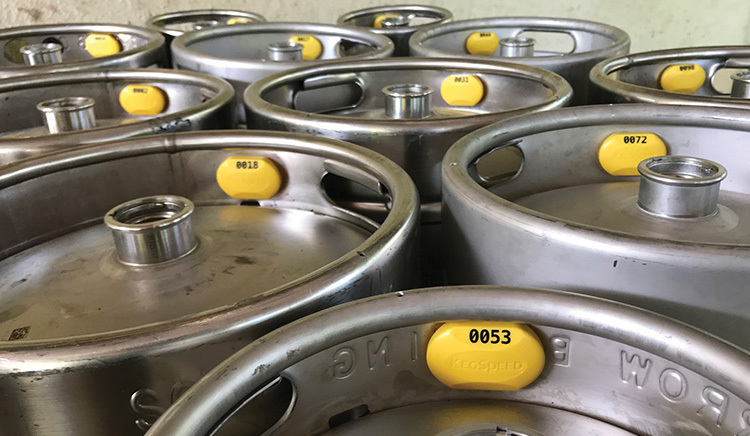 Unlike RFID, which degrades rapidly when kegs are palletized and stacked, the KegSpeed system continues to operate even when kegs are stacked. The KegSpeed tracker is lightweight and is applied with industrial 3M VHB adhesive tape. The adhesive is waterproof and resilient to the chemicals used during keg sanitation. The trackers are applied when the metal of the keg is clean, room temperature, and dry. The adhesive provides a strong bond that prevents the tracker from being removed by hand (although with enough leverage using a prying tool it is possible to get the tracker to come off ). The tape is resilient in all the temperatures a keg might find itself– from below freezing to the indirect heat of sterilization. Each tracker is placed on the chine of the keg, not directly contacting the keg body but centered between the top of the keg body and the underside of the rolled rim of the chine. Because the tracker is on the chine, under the rolled rim, it is physically protected from being hit, and is also protected from the full heat of sterilization that happens to the keg body. Every tracker has a unique serial number which identifies it to the KegSpeed system. In addition, a visible identification number is printed on the front of the tracker so that kegs can be identified by sight. The only manual interaction needed with the KegSpeed system is to record when kegs are filled – the date and product of fill. This can be done using the KegSpeed mobile application and the keg serial numbers. Depending on the configuration of the brewery filling area, distance from the mobile device can be used to distinguish all kegs, for example, just filled and put on a pallet. Once a keg is updated with the date and product of fill, the KegSpeed system keeps track of the location of the keg and the age of the product within it automatically, wirelessly, and without requiring any manual interaction or scanning. Freshness is an important quality to draft beer consumers. Using KegSpeed, you will be able to report exactly how old each product is at each retail location. Marketing freshness is a powerful tool for draft sales. You can also run campaigns to connect more deeply with your consumer – for example, having consumers “sponsor a keg” and track which on-premise outlets it visits as it is filled and emptied. KegSpeed allows you to see in real-time where your kegs are, and how long they have been there. Sales and delivery are able to prioritize visits based upon the history and status of kegs at each account. Knowing where your full and empty kegs are allows you to plan more efficiently. (1.) Starting with an average turn time per keg of 10 weeks, if the time is reduced by one week to 9 weeks, the number of kegs needed to service the same amount of product is reduced by 10%. You save 10% in the cost of your kegs. (2.) Using 5% keg loss per year, the average keg is retained 10 years before being lost. If a keg costs $90, and is lost after receiving a $30 deposit, the resulting cost to the brewery is $60. Spreading this cost over the life of the keg, each keg costs $6/year, or $0.50/keg/month. Once the keg is lost, however, the entire $60 is gone. (3.) A significant proportion of kegs end up at the wrong location – either at the wrong distributor, the wrong vendor, or returned to the wrong brewery. Knowing when and where a keg gets misplaced and acting on it immediately dramatically increases the chance of retrieving it. Copyright © 2018 KegSpeed, LLC - The KegSpeed hardware and system is protected by US and WIPO Patents.